Family court Judge Robert Longstreth is facing a challenge in the June election. Pastor Chris Clark of East Clairemont Baptist Church was involved in the fight to keep the cross on Mt. Soledad and helped rally hundreds of religious leaders statewide for the Yes on Prop 8 campaign. It’s why he decided to join 20 other members of the community, primarily politicians and Christian pastors and activists, to be in video endorsements for bettercourtsnow.com and support a slate of candidates to challenge local incumbent Superior Court judges in the upcoming June 8 primaries. Clark was asked to participate by Bettercourtsnow.com creator Don Hamer, pastor at Zion Christian Fellowship. The Web site, which launched in December, is meant to inform voters and let judges know they will be held accountable for their decisions and can be replaced, Hamer said. Hamer started to organize the idea of the site three years ago, “long before Proposition 8 became an issue,” he said, though he added the statewide measure that banned gay marriage didn’t hurt their attempts to rally a conservative base against judges. An official slate of candidates will be released at the end of the month. No incumbent judges were interviewed for endorsements, and no particular criticisms or examples of judicial activism will be posted to the site, Hamer said. Each candidate went through a “vetting process” in which they were asked whether or not they support abortion or gay marriage. “We did ask those questions, but the answers came back in a way that we know we had fair and just judges,” Hamer said. Three of the four incumbents to be challenged are family courts judges, and three sit on the bench in El Cajon. — Larry Kincaid challenging Judge Joel Wohlfeil. Superior Court judges are appointed by the governor, but every two years about one-third of Superior Court judges face election campaigns. 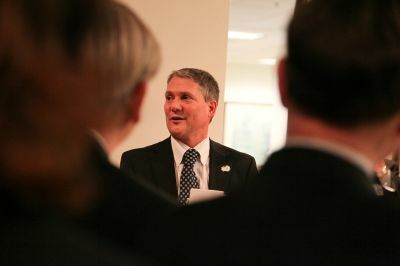 Challenging incumbent judges is rare, especially for someone like Longstreth, who has only been a judge in downtown family courts since June 2008 and held a fundraiser last week at his former law firm downtown. Top endorsements for Longstreth include deputy district attorneys and sheriffs, and former sheriff Bill Kolender. Also at the fundraiser were about 30 sitting Superior Court judges, as well as City Attorney Jan Goldsmith, public defender Henry Coker and Judge Harry Powazek, who almost faced a challenge of his own, said campaign adviser Jennifer Tierney. Tierney will run the election campaigns for three of the judges being challenged. She was surprised to see so many judges challenged since each is considered pretty moderate. “If someone starts that drumbeat about being too conservative or liberal, these races are run with so little money it’s hard to do anything about it,” she said. Though Tierney’s Gemini Group has run election campaigns for 90 San Diego judges, she isn’t sure what to expect. Since there are no limits to budgets of Superior Court races, money on both sides will be critical. “We won’t know how organized they are until we see their financial filings and where the money’s coming from,” she said. Sam Godkin met Longstreth once at a friend’s social event. Godkin ran his family law practice in San Diego for 12 years before having his first child three years ago, which made his work much more personal. “Having kids added a whole different perspective to me I never saw,” he said. He agrees judges need to decide cases in a uniform way, and said he came to the fundraiser because he believes if he ever had to appear in family court with his own children, he’d want someone like Longstreth to preside over the case. Longstreth’s opponent Trask, a vice president at a mortgage lender, declined to comment on the race. Brett Maxfield was running against Powazek, but Maxfield’s intent-to-run petition was thrown out. The retired judge ruling on the case came from Riverside County. “No judge in San Diego County would touch it with a 10-foot pole,” Maxfield said, claiming his petition to run was thrown out on a technicality. In order to campaign to be a Superior Court judge, candidates have to have at least 10 years of membership with the state bar, which Maxfield claims took place after he was sworn in June 1, 2000, not the date on his Bar card, July 31, 2000. “The whole system is so rigged down here. It’s very difficult to get justice around here,” Maxfield said. Maxfield said he wanted to appeal but couldn’t get it before a judge in time. “If there’s anything illegal about what the Superior Court did, someone more powerful than me’s going have to make it right,” he said. Maxfield moved to San Diego in 2004 working in the city’s real estate assets department, where he said he saw widespread corruption and was fired for blowing the whistle. Afterward, he worked in securities fraud law, ran for the state Assembly and applied for the local U.S. district attorney post, but is now considering leaving San Diego. The bettercourtsnow.com site doesn’t have to do with religion and isn’t politically motivated, Clark and Hamer said. It has to do with identifying activist judges, promoting strict constructionism on the bench and informing voters. But some content on the site could be seen as contradicting this claim. Aside from the endorsements, nearly all posts on bettercourtsnow.com are news stories verbatim from — but not always attributed to — other sites. The sites are mainly newspapers, but also christianpost.com stories reporting about prayer in Florida schools and Christian student groups’ right to exclude non-Christians from becoming voting members or leaders. A Protect Marriage Action Fund press release is also included. In partnership with Protect Marriage, Clark worked with more than 300 pastors statewide to help rally the Christian vote for Proposition 8. There are three separate posts of a video of the last 10 minutes of a Newt Gingrich speech at a David Horowitz gathering, which sums up the strategy for conservative political victory in 2012 elections. The only post that looks truly unique or made by site creators is entitled “They are taking your children” about family rights in family courts. Again, no particular judges or decisions are named. “We must keep innocent parents from losing their children and breaking up families based on hearsay evidence and the whims of judges,” the post reads. The Ramona Tea Party is tentatively scheduled to host Hamer, who will discuss judicial activism at a May 29 meeting, just ahead of the June 8 primaries. Patrick Kiernan, another member of the Tea Party steering committee, met Hamer by posting a link to the Ramona Tea Party Web site on Bettercourtsnow’s Facebook page. Kiernan and his wife Norma own a garden supply store in Ramona. Like almost everyone they know in the Tea Party, Kiernan said, this is the first time they’ve been politically active in their lives, though they have always voted. Norma, a former legal assistant for law firms, school districts and at one time the state attorney general, said she has never visited bettercourtsnow.com. Still, she said, people should know who they’re voting for in Superior Court races, just like any other election. This entry was posted on Sunday, June 22nd, 2014 at 8:42 pm. It is filed under Story Archive and tagged with bettercourtsnow, courts, government, judges, politics, San Diego Judiciary, San Diego Superior Court, SDNN. You can follow any responses to this entry through the RSS 2.0 feed.